Welcome to Club Onyx, Houston’s only upscale urban gentlemen’s club. We offer High class entertainment to some of Houston’s top business men, lawyers, doctors and professional athletes. With over 12,800 square feet of entertainment, Club Onyx offers two full service bars with a wide variety of bottle services for all your needs. Experience our full menu with our signature Onyx wings! Come and enjoy one of our exquisite V.I.P. rooms were we can host your next private party or just your regular night out on the town. Club Onyx features over a hundred of the hottest entertainers Houston has to offer. When the city goes to sleep, we provide the official late night after hour spot with visitors coming from all over the city as well as nation wide. Next time you’re in the Galleria area, stop by and enjoy our fine dining and superior entertainment at Club Onyx Houston. Do you work in the hospitality industry?! If so, we are hosting a night just for YOU! Kappa Men's club and Nitelife Elements Productions proudly presents BN's ONLY industry appreciation night! Let us treat YOU with true hospitality and EXTREME specials! All bar, restaurant, and hotel workers get into the event for just $5 with proof of employment! Serving up $100 bottle service, $5 shot of the week, and food specials! Presenting a new Guest DJ every week to keep the party going till 4AM! We can't wait to see you for S.I.N. 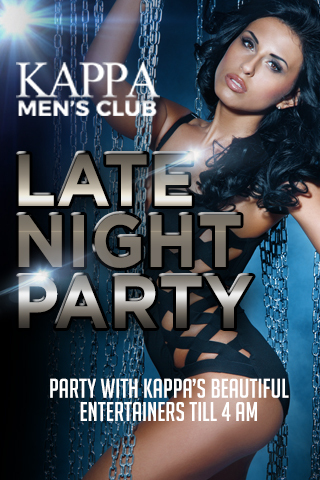 Join Kappa Men's Club After Hours Party, Going Until 4AM. Party with Kappa's beautiful entertainers until 4AM. For more information about our packages or the club, please call the number below. To become a Kappa Kabanna entertainer or to apply for other employment opportunities, visit our career section or call for more information. Tell us a little about yourself and your personality including a brief summary of your experience in the industry.